Kurt Busch started third and finished seventh, collecting four bonus points. The No. 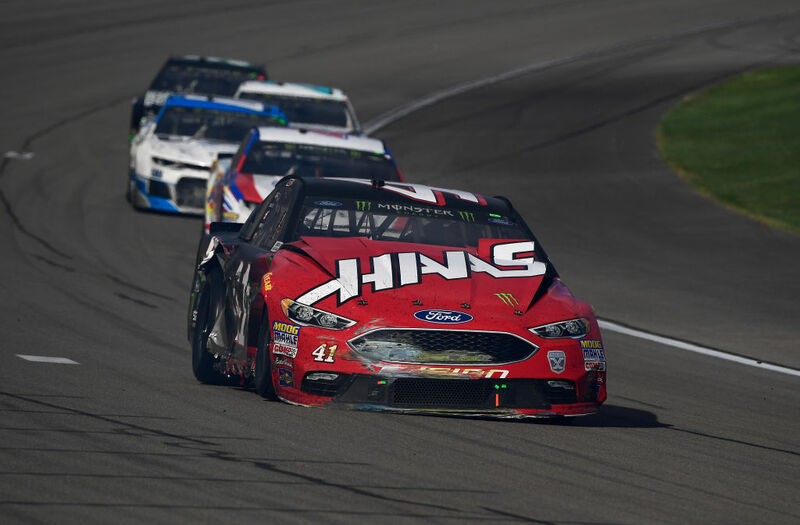 41 Haas Automation Ford Fusion battled a loose condition early on but was in the top-five. Busch pitted on lap 37 for four tires and fuel. Started eighth, finished eighth and collected three bonus points. The No. 41 Haas Automation Ford Fusion pitted on lap 82 for four tires, fuel and a chassis and tire pressure adjustment. Busch pitted on lap 121 for four tires and fuel while running in seventh. Busch pitted on lap 163 for four tires, fuel and a chassis adjustment. On lap 177, Busch pitted for four tires, fuel and a chassis adjustment. On lap 183, the cars driven by Busch and Chase Elliott got together exiting turn four. Both cars made contact with the SAFER Barrier on the outside retaining wall and were too damaged to continue. Busch finished seventh in Stage 1 to earn four bonus points. He finished eighth in Stage 2 to earn an additional three bonus points. This was SHR’s fifth Cup Series victory with Ford. This was Harvick’s second win, fifth top-five and eighth top-10 finish in 18 career NASCAR Cup Series starts at Las Vegas.